US equity indexes closed moderately higher, sp +11pts at 2459. The two leaders - Trans/R2K, settled higher by 0.4% and 0.2% respectively. 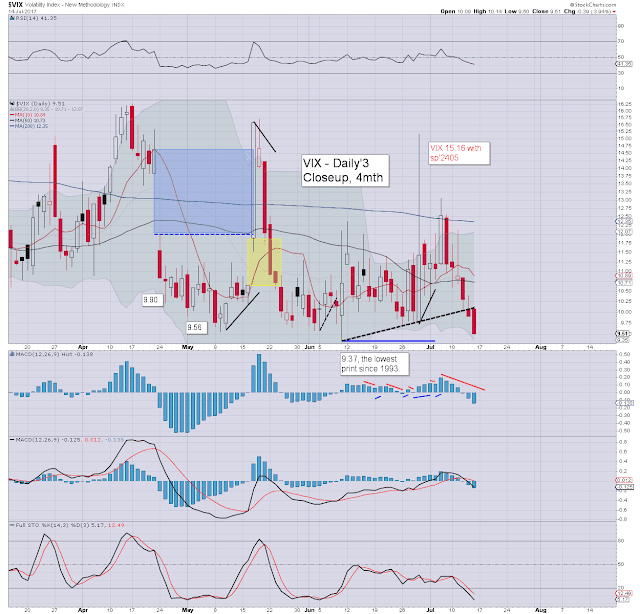 VIX settled -3.9% at 9.51. 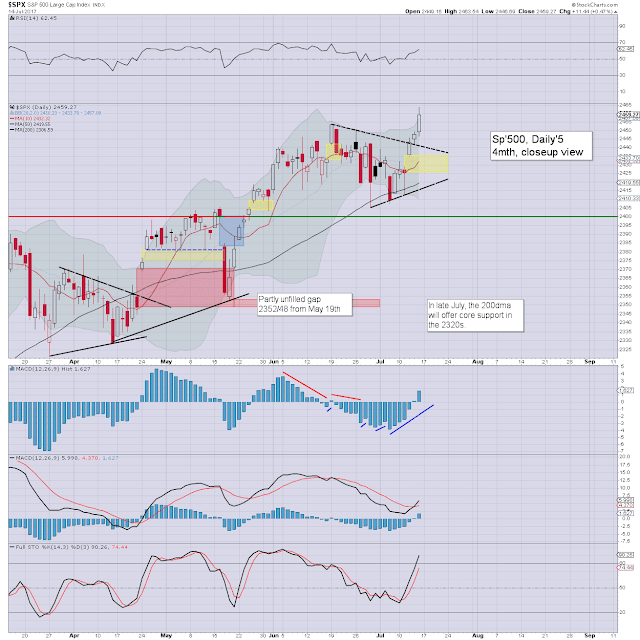 Near term outlook offers a retrace, but no lower than the gap zone of 2435/25. Any hopes of sp <2400 in July/August should be dropped. US equities opened fractionally mixed, but quickly turned upward, and kept on climbing into the late afternoon. There were notable new historic highs for the Dow, NYSE comp', and the sp'500. 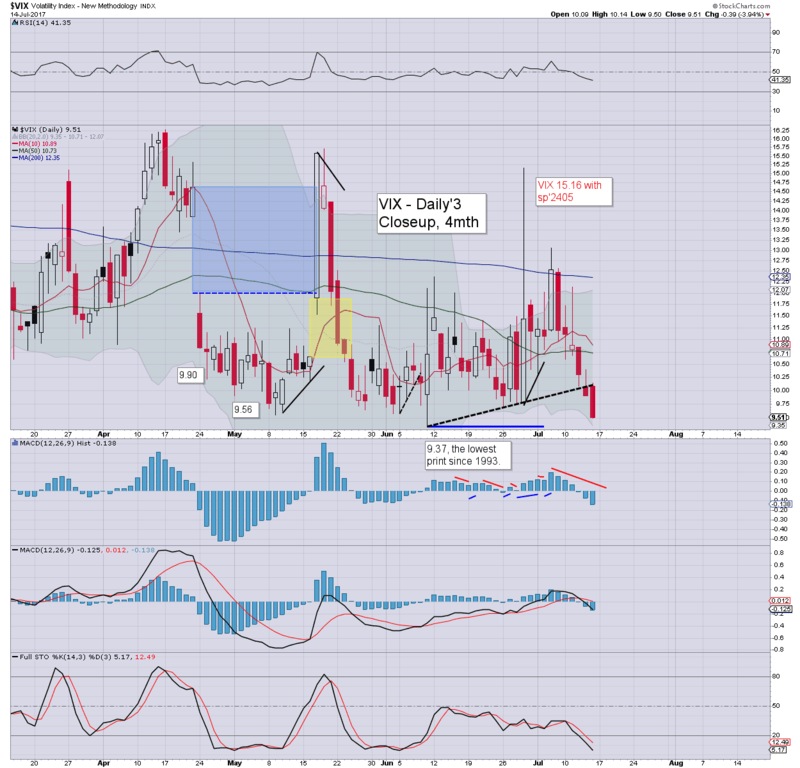 With equities breaking new highs, market volatility was ground lower, with the VIX settling lower for a sixth consecutive day. To be clear, with a quartet of new index historic highs this week, any hope of sp <2400 in July (and probably Aug') can be ditched. A retrace to the gap zone of 2435/25 is still due early next week, but then a serious push to the 2500s. The elusive 5'% minor correction now looks set to occur within the typically 'delicate' time of Sept/Oct.